When I turn it on it blows the breaker new home any idea’s.Tried different outlets no good.was working fine till about three weeks ago.Any idea’s ? What happened when you tried different outlets? The breaker cuts out? Sounds like you have to much amperage on 1 circuit. Double check outlets and breakers for lose wires. I have an EdenPure Gen 2 model A5095. The bulbs light up beautifully when I turn it on but the fan never kicks on so it shuts down. Is there anything besides the fan that it could be? A fan for it is $42 dollars but if there’s something less expensive that could be wrong, I’d rather start with the least expensive repair that may fix it and work my way up. If it is most likely the fan, then I’ll be ordering that next week. Thanks! Happy New Year! I have much the same problem and would like to know how to take it apart so I can check out what part is not working. I cannot find anyplace where the Gen2 is taken apart. And it doesn’t seem like anyone ever answers questions on this site either. Do we need to replace. I have a EP Gen4 that will not automatically restart after it shuts down. any ideas as to what could be causing this problem? Was just fine after replacing all bulbs. Now it heats fine and shuts down automaticaly but won’t restart. Thermostat? I have a Gen 3 that doesn’t turn on I do get a power lite but doesn’t turn on. I replaced the transformer and thermostat. I checked the heating element with an OHM meter, with the meter set to 10X each reads 1.4 to 1.8. Can you point me in the right direction? MY eden pure Heats up (bulbs glow ) but no heat regulation. stays the same all the time. Hit the mode key and the little lights light up but no change in fan speed or heat hotter like it use too! Any Help here? Thanks! I have one that reads unlevel all the time. How do I fix it anyone k ow? 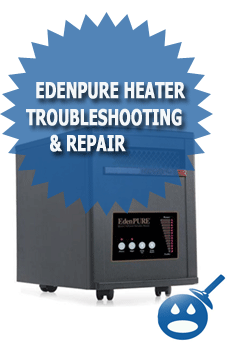 I have a edenpure model RPE1500 and when you cut it on it heats up blows hot air for a few minutes then the bulb dims and it blows cool air filter is clean could it be the thermostat or something else? my eden pure heater comes and then goes to mode and then shuts off and comes back on in about and hour what is causing this? I would like for it to stay on continuously. Why would anyone want to reply to rudeness? Heater #1. Have two 1000xl heaters. One, I can only control from the remote. Without using the remote I can work the temp upward but not downward and it also will not start back up after the room cools off. What parts do I need for #1 heater, and the #2 heater? EdenPure gen21 would not power up. I took it apart and found a cutout tripped and i reset it. The heater came on and worked fine for several hours and then quit again. Has anyone else had this problem? I would be grateful for any help. 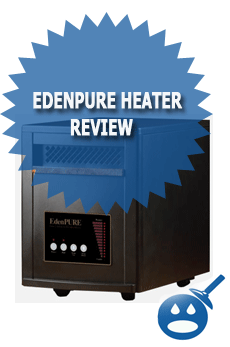 I have a edenpure 1000xl heater that just started making a loud noise.